Have you ever wondered why paintbrushes come in different shapes? Why are there other shapes beyond the flat, traditional paint brush? Let's take a look at the different shapes and understand what they are used for. The bristles of a flat paint brush are cut square to the handle. This allows the brush to deposit the maximum amount of paint when the brush is pulled across a surface on its flat side. Most flat brushes have full bodies. They have a relatively thick body that holds a lot of bristles. This allows the brush to hold more paint, which in turn allows the brush to cover more area before it needs to be reloaded with paint. 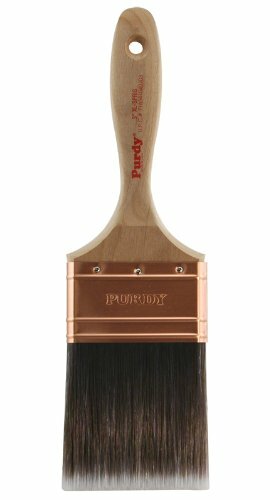 Flat paint brushes are best used for covering large areas as fast as possible. Using one for cutting-in is difficult, because the brush must be held perfectly perpendicular to the surface in order to produce a straight line. Novices often buy this type of brush, because it looks like a paint brush should look like. It's a useful tool, but it's not a tool for every situation. A sash brush is designed to be pulled along its short side. The bristles are cut at an angle to allow them to flow over the surface as the user pulls the brush across the work piece. Sash brushes are used for cutting-in and painting straight lines. Pulling the brush inline with it's bristles results in very little bristle deflection. This makes the brush much easier to control. All of the paint is deposited in a line, and none of it ends up the trim. Most sash brushes have thin bodies, which further helps with accuracy. This also reduces the brush's paint holding capability. A good sash brush is the far superior tool compared to a flat brush for cutting-in a wall for ceiling. A good painter can use a sash brush to cut-in a wall without using any masking tape. Angular brushes are a hybrid between the two. They have the angular bristles of a sash brush, and the full bodies of a flat brush. Flat paint brushes excel at filling in large surfaces. They hold a lot of paint, but are not very accurate. Sash brushes have angular bristles. They excel at cutting-in surfaces and painting straight lines. Angular brushes are hybrid brushes. They can do it all, but not necessarily as well as the other two types of brushes.